Todi is a picturesque medieval hill town in Umbria, surrounded by medieval, Roman and Etruscan walls. Although it's a hill town, its center at the top of the hill is flat. The central piazza, originally the Roman forum, has several beautiful medieval buildings. Sights are close together and there are good places to linger, enjoying the views or the ambiance. 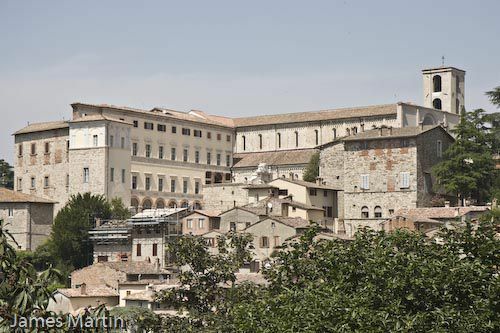 Todi or the surrounding countryside would make a peaceful base for visiting southern Umbria. Todi is in the southern part of the Umbria region, the region in the center of Italy. Like neighboring Tuscany, Umbria is dotted with hill towns but has fewer tourists. It's easy to visit as a day trip from nearby towns like Spoleto (44km), Orvieto (38km), or Perugia (46km). Todi is near the Tiber River overlooking the Tiber Valley. See the Umbria Map on our Europe Travel site for its location. Todi can be reached by bus from Perugia. Local buses run around the perimeter and into the center. The train station, Todi Ponte Rio, is connected by bus. By car, it's on the E45, about 40 km east of the A1 autostrada. There's a large pay parking lot, Porta Orvietana, below the town center with a lift into town. The closest airport is in Perugia for flights within Europe and the closest large airport is Rome Fiumicino, about 130 km away. The tourist information offices are at Piazza Umberto I, 6 and Tourist by Palazzo del Popolo in the main square. Public restrooms are located near Palazzo del Popolo and below town by Santa Maria Della Consolazione and Porta Orvietana parking. In late summer, the Todi Art Festival has art exhibits and drama, opera, classical music, and ethnic music performances and there are "summer evening" events scheduled throughout the summer. In July is the Gran Premio Internazionale Mongolfieristico, an international ballooning competition with 50 hot air balloons from Europe and the US. Carnevalandia is a big carnival festival usually held in February. The theater is held in the Teatro Comunale from November through April and there's ice skating in the main square from mid-November through mid-January. The 4-star Hotel Fonte Cesia is in a 17th-century building right in the historic center. Many rooms have views of the valley. Hotel Tuder is a 3-star hotel 800 meters from the historic center with parking and a restaurant. In the countryside near Todi, all with a swimming pool, are the country house Hotel Villa Luisa, farm house Tenuta di Canonica, and Farmhouse Residenza Rocca Fiore. Piazza del Popolo, or people's square, is the large central square built above Roman cisterns (open for visits). This was the site of the Roman forum. On the square, you'll find the cathedral and three public buildings from the 13th century. Palazzo del Popolo is one of Italy's oldest public buildings but was restored in the 19th - 20th centuries. Palazzo dei Prioi has an unusual trapezoid shaped bell tower. There's a bar on the piazza where you can enjoy a drink. Palazzo del Capitano, next to Palazzo del Popolo, is a grand building with elaborate windows built over a portico. It houses the Etruscan-Roman Museum and the Pinacoteca, art museum. The museums are closed on Mondays. A ticket including both museums and the Roman cisterns cost euro 5 in 2007. The Duomo, begun in the 12th century, was built over a Roman temple. It has an outstanding central rose window. Inside are a 14th-century altarpiece, frescoes, and inlaid wood choir stalls. Behind the Duomo is a Roman house with a mosaic floor. Beyond the duomo, near the Convento delle Lucrezia, is a great view spot. You'll also see remains of Roman and pre-Roman walls here. Tempio di San Fortunato, on piazza Umberto, was built in 1292 on the site of an older church. The exterior has a Gothic doorway and is decorated with sculptures and inside are 13th-14th century frescoes and magnificent inlaid wooden choir stalls. The crypt holds the tomb of Jacopone da Todi, a medieval poet, and mystic, whose statue is outside the entrance. From the bell tower, there are good views of the countryside. Next to the church are gardens and a path leading past the castle ruins and good view spot down to Santa Maria Della Consolazione. Santa Maria della Consolazione is below the town, near the edge of the 13th century walls. It's a large 16th-century church with four apses and a beautiful dome and is one of central Italy's best Renaissance churches. Santa Maria in Camuccia was erected in the 7th-8th centuries and restored in the 13th century. It's in the area between the two Roman perimeter walls. Underneath the church is an archaeological excavation. The former Church of the Trinita' now holds a small museum. San Nicolo' de Cryptic was built in 1093 on the site of the Roman amphitheater whose remains are visible in the courtyard. Piazza del Mercato Vecchio, or old market, also has some Roman remains.